It’s Friday and time to share another weekend treat! 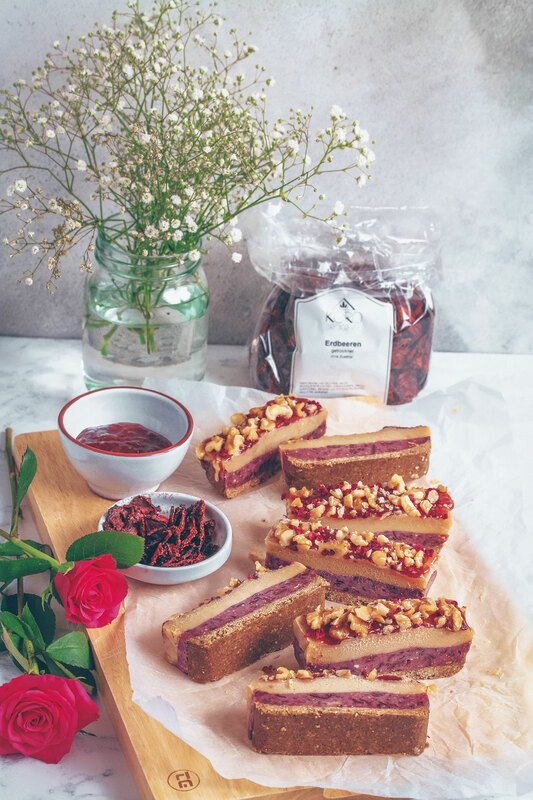 If you’re looking for something delicious, decadent and fancy to make for your friends or family this weekend, then look no further! I can promise you they’ll be impressed with these beauties, especially once they find out they’re completely plant-based with no dairy in sight! 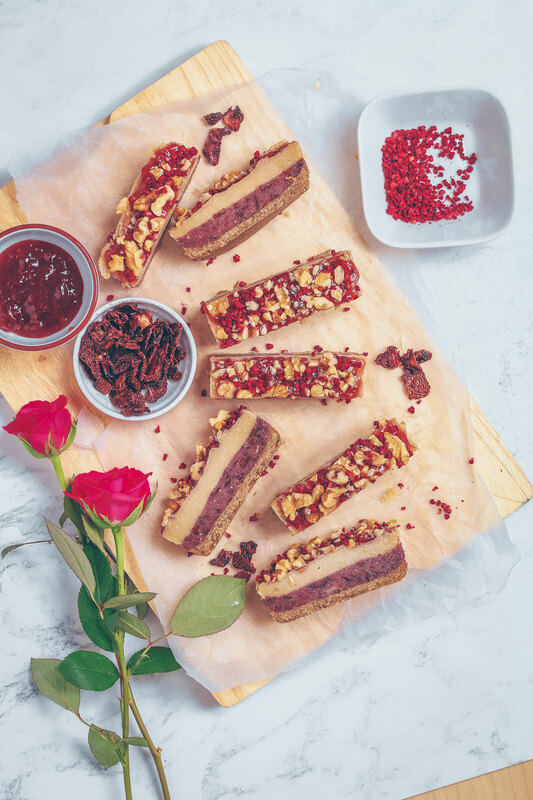 Even if you’re not vegan or you’re thinking of serving these bars to none vegans, they’re definitely a crowd pleaser! 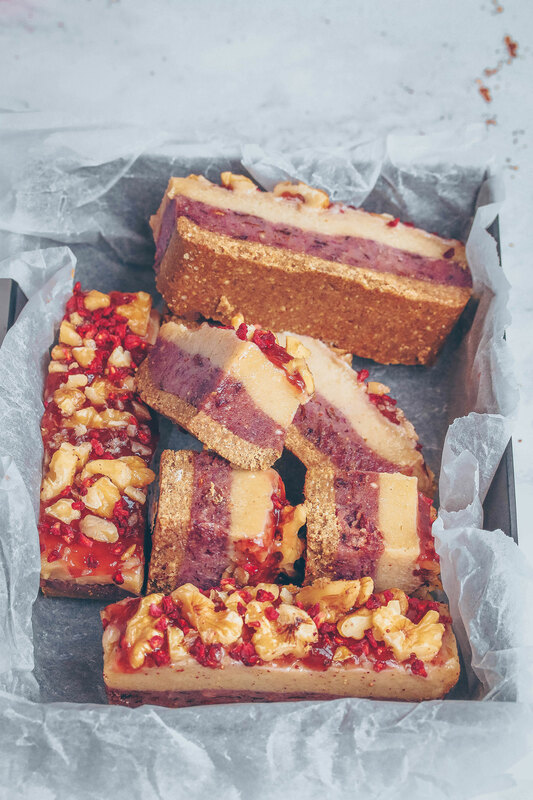 Fruity, rich bars with a bit of crunch. What’s not to like? I’m so thrilled to announce I’ll be working with Koro on some video content over the coming months. 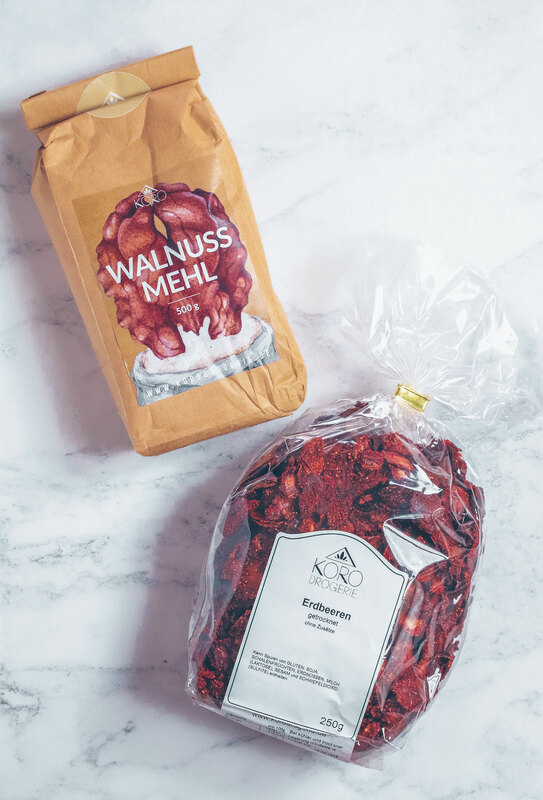 They’re a Berlin based health food online store selling everything from your basics like dates, nut and seeds, to more unusual and interesting ingredients like chia flour, pomegranate protein powder and dried blueberries. Their website really is a food blogger and health enthusiast dream! I could easily spend hours browsing all their ingredients and dreaming up recipes. 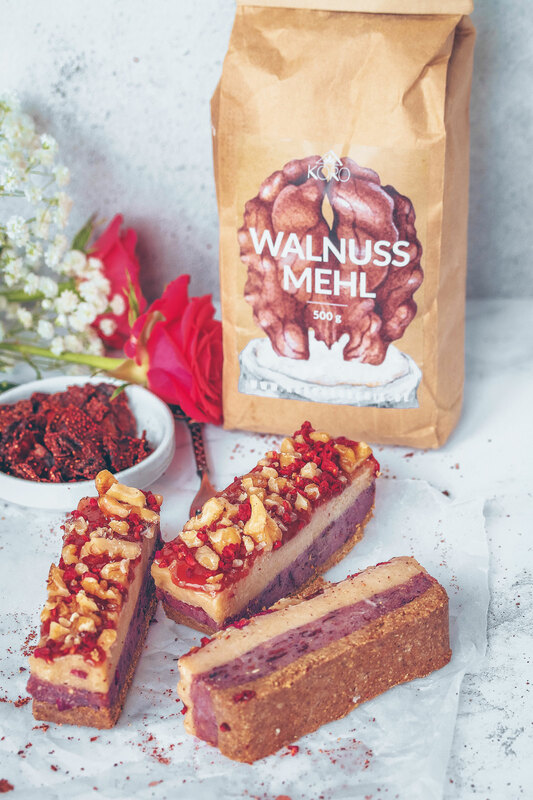 The bars are made up of 4-5 layers (depending on whether you count toppings as a layer) – a basic walnut base, a strawberry layer, vanilla layer and strawberry jam layer. All topped off with chopped walnuts and dried strawberries. I love desserts with layers. They just look so much more appealing to me. Also the contrast between the pink and white layers reminds me of strawberry and cream lollipops, which were always (and still are) my favourite lolly flavour. 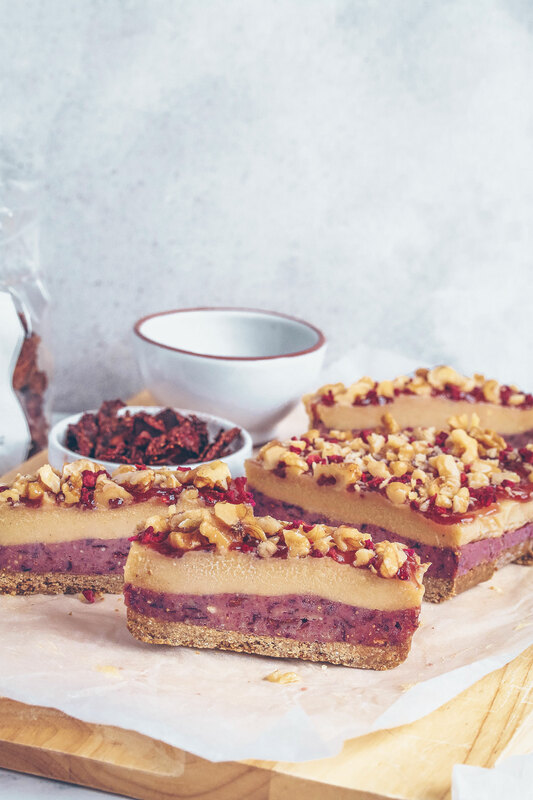 I wanted to create peanut butter and jelly inspired cheesecake bars, but while browsing KoRo‘s website, I came across their walnut flour and was so intrigued by it. I’ve tried almond flour and peanut flour, now I wanted to try walnut flour! That’s what I used to create the base. For the filling, I used cashews and added in some KoRo dried strawberries that I blended into a powder. It adds so much flavour as well as a beautiful pinky tone. I finally topped it off with jam, chopped walnuts and more dried strawberries, because why not! Mix all the base ingredients in a bowl, then press into a loaf tin lined with parchment paper. Freeze for 30 minutes while you prepare the filling. 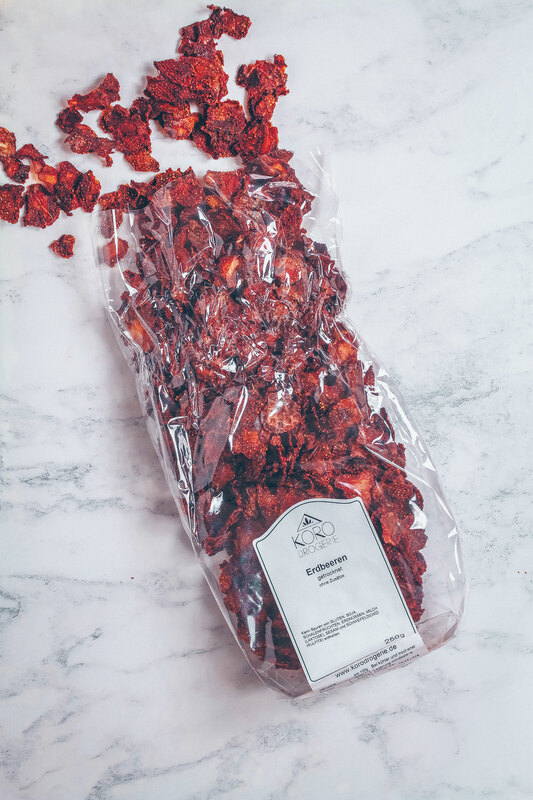 Add all the filling ingredients (apart from the dried strawberries) into a blender and blend until smooth. Divide the filling equally between two bowls. Add the dried strawberry flour (and beetroot powder if using any) into one of the bowls and mix to combine. Smooth the strawberry layer over the base, then return to the freezer for one hour. Spread the plain layer over the strawberry layer and freezer for another hour. Spread the strawberry jam on top and sprinkle over the chopped walnuts and dried strawberries. Thanks to KoRo for sponsoring this post. Commissioned posts is how I’m able to continue working on the blog and creating recipes and recipe videos for you. As always, all opinions are my own. 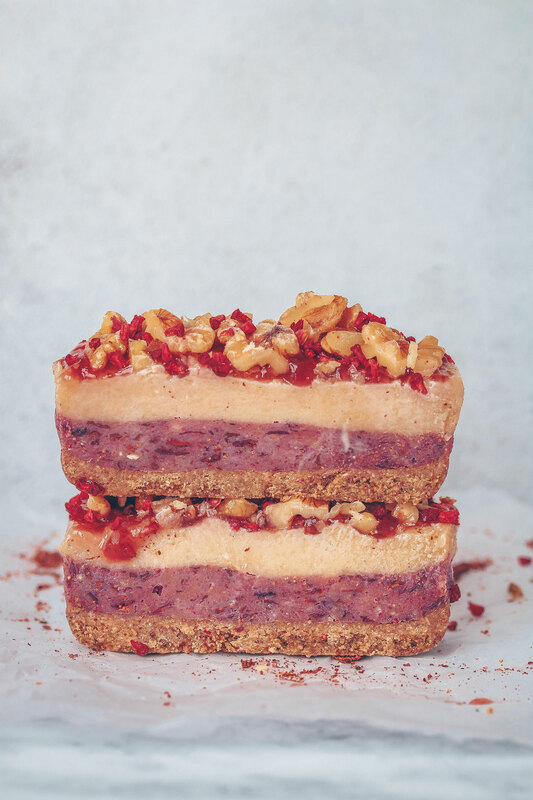 These no-bake walnut strawberry bars look scrumptious, Nadia. Your video really made things look easy. I am sure it tastes delicious. what can I use instead of coconut mousse ? Not all products in your recipe are available in Canada. For example, walnut floor is not available.